On March 16, 2019, the first flight of the third MC-21-300 test aircraft took place at the airfield of Irkutsk Aviation Plant, the affiliate of Irkut Corporation (a UAC member). The duration of flight was 1 hour 30 minutes at an altitude of 11,500 feet and a speed of up to 253 knots. The plane was piloted by the crew of Andrey Voropayev and Roman Taskaev test pilots. According to the crew report, the task was performed completely, the flight was in normal mode. "MC-21-300 flight tests are continuing. Today the third aircraft joined to them. 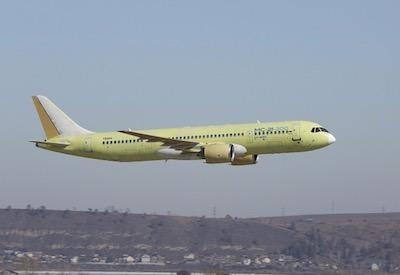 On this plane, in addition to special testing equipment, a passenger cabin is installed," said Denis Manturov, Minister of Industry and Trade of the Russian Federation. According to Minister of Industry and Trade Denis Manturov, it was decided to hold the premiere public debut of the MC-21-300 aircraft with a passenger interior at the Moscow international aviation and space salon MAKS-2019. “This will allow us to visually demonstrate to potential customers and future passengers one of the most important competitive advantages of the Russian airliner - an increased level of comfort,” Manturov said. Yuri Slyusar, president of UAC and Irkut Corporation, added that in 2019 the fourth MC-21-300 prototype, built at the Irkutsk Aviation Plant, will join the flight tests. “Airplanes are built on new automated lines that provide high precision and quality of assembly,” Slyusar said.